Of all the input devices, the keyboard is the greatest. This comes at a cost, though: there were times back in the Before Days, when video and music editing applications came with custom keyboards. There were Pro Tools keyboards, Final Cut keyboards, and innumerable Adobe keyboards. What’s the solution to this problem? More keyboards, obviously, and this time we’ll make them modular. 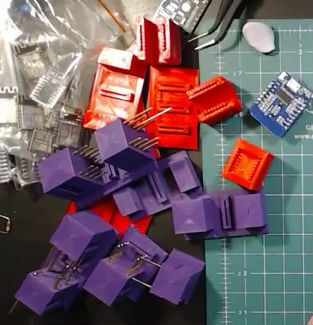 For his Hackaday Prize entry, [Cole B] is building modular, programmable USB keyboards. It’s got everything: a standard 3×3 keypad, a keyboard that’s just four potentiometers, a keyboard that’s a rotary encoder, and a keyboard that’s a set of faders. The design of these keyboards is inherently modular, and that means there needs to be a way to connect all these modules together, preferably without a bunch of USB cables strewn about. Right now, the best idea [Cole] is working with is pogo pins and magnets. It’s a great idea although Apple Thinks Differently™ and probably wouldn’t be too keen on seeing the whole ‘magnets and pins’ idea stolen out from under them. Nevertheless, it’s an excellent project that shows how far you can go with manufacturing on a limited budget. These are fantastic keyboard modules already, and the connector scheme already pushes this project into the upper echelon of keyboard hacks. A few weeks ago, I was working on a small project of mine, and I faced a rather large problem. I had to program nearly five hundred badges in a week. I needed a small programming adapter that would allow me to stab a few pads on a badge with six pogo pins, press a button, and move onto the next badge. While not true for all things in life, sometimes you need to trade quality for expediency. This is how I built a terrible but completely functional USB to serial adapter to program hundreds of badges in just a few hours. A lot of modern PCBs have small pads with no components attached. They are often used as test points, JTAG ports, or programmer connections. There’s no connector on the board, just pads. To use those, test equipment and programmers utilize pogo pins. These are small pins with a spring inside, reminiscent of a tiny pogo stick. To use pogo pins effectively, you need a way to hold them in the right position and something to put pressure on them while they are in use. [Joshua Brooks] used a strip board to hold them in place and clothes pin to keep the pressure on them. [Johan Kanflo] built a sweet little ESP8266-based wireless camera. It’s a beautiful little setup, and that it’s all open and comes with working demo code is gravy on the cake! Or icing on the potatoes. Or something. [Johan]’s setup pairs an ESP8266-12 module with an Arducam, which looks like essentially an SPI breakout board for the ubiquitous small CMOS image sensors. The board naturally has a power supply and headers for programming the ESP module as well as connectors galore. Flash in some camera code, and you’ve got a custom WiFi webcam. Pretty slick. But since [Johan] designed the ESP-8266 board with standard female headers connecting to the ESP, it could also be used as a general-purpose ESP dev board. [Johan] built a few daughterboards to go along with it, including a bed-of-nails ESP8266 tester (since you can never tell when you’re going to get a dud ESP unit) and WiFi-to-RFM69 radio bridge. That’s two awesome applications for a tidy little system, and a reminder to design for extensibility when you’re laying out your own projects. We’ve previously covered [Johan]’s Skygrazer project, which tracks planes as they fly overhead and displays them on a gutted old Mac. Is it any surprise, then, that he’s also created an ADS-B-controlled moodlight? This guy is on fire!